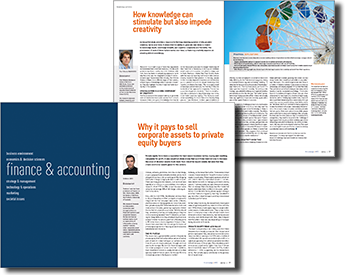 The annual publication, Knowledge@HEC2016, produced in association with Business Digest, is out. 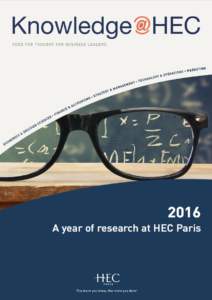 It revisits a year of research and reflection at HEC Paris in marketing, finance, strategy, management, and more. The new edition covers subjects as varied as conformism and originality in strategy, activist influence, decision making and uncertainty, risk estimation, knowledge and creativity or sociology. Starting this year, Knowledge@HEC has expanded to Qatar with an issue produced specifically for HEC Paris in Doha. 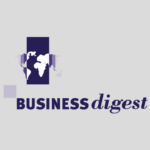 Further proof that management research is becoming increasingly important to any country that wants to make knowledge a key success factor for economic dynamism. Economics is not considered the most successful scientific discipline, to say the least. There are various lines of critique of the field, some more justified than others. Two recent research papers attempt to add new angles to this methodological discussion, arguing that economic models can be useful and serve society in ways that differ from the classical view of science. Researchers in other social sciences, as well as laypeople, often question why economic models analyze the behavior of “homo economicus”, when psychological research shows it to be an unrealistic model. Why are economists relatively unperturbed by the violations of their models’ assumptions in experiments? How can oversimplified and “toy” models be of use in making predictions? These methodological problems have been discussed since the 1950s, most famously by Milton Friedman, and have received more attention in recent decades. Based on « Economic Models as Analogies », Economic Journal , signé I. Gilboa, A. Postlewaite, L. Samuelson et D. Schmeidler, 124 (2014), F513-F533 ; « Economics: Between Prediction and Criticism », signé I. Gilboa, A. Postlewaite, L. Samuelson et D. Schmeidler, version mise à jour en 2016.